The Web is full of social and cultural biases. Reducing these biases and building more inclusive online platforms seems almost impossible, yet it is a pressing societal challenge. Thanks to a multidisciplinary approach integrating sociology, ethics, design, and computer science, the WeNet project aims to work on theses issues. The use of technology and particularly of machine learning techniques will allow to model and account for human diversity. The social computing group at Idiap is a key partner among the 15 participants of this international H2020 project. The WeNet platform will use machine learning to build user profiles based on behaviour and other key factors following ethical principles. The profiles will be matched to make positive use of the diversity of users, allowing them to help one another. By connecting people from diverse backgrounds and skill sets, WeNet will enable people to interact and incentivize them to assist one another in ways that would not formerly have been possible. Beyond the technical challenges, the platform will have a direct positive impact on people. It will be used for a series of studies within universities worldwide with diverse student populations. The aim is to contribute to improve students' quality of life inside and outside the academic environment, taking into consideration ethical and privacy guidelines. WeNet will start with a number of Smart University pilots to exploit diversity case studies. To ensure the long-term sustainability of the research infrastructure, a non-profit organization will be created, which will be in charge of managing the infrastructure and the community. 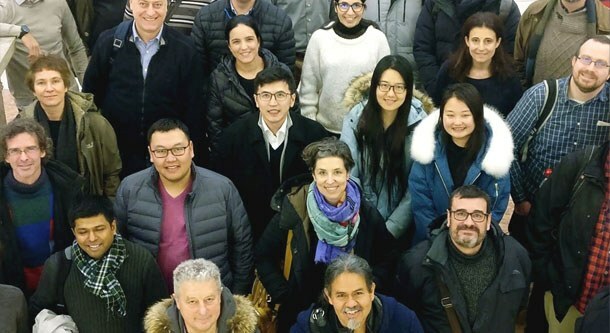 Reflecting this crucial diversity, the WeNet consortium, led by the University of Trento, is composed of partners from Europe and Israel, India, Mongolia, Paraguay, Mexico and China. The complementarity of the consortium partners is one of the greatest added values of WeNet, which includes highly rated universities and SMEs. Università degli Studi di Trento (Italy), Open University of Cyprus (Cyprus), Ben-Gurion University of the Negev (Israel), Martel Innovate (Switzerland), U-Hopper Srl (Italy), Agencia Estatal Consejo Superior de Investigaciones Cientificas (Spain), Aalborg Universitet (Denmark), London School of Economics and Political Science (United Kingdom), Eberhard Karls Universitaet Tuebingen (Germany), Universidad Catolica Nuestra Senora de la Asuncion (Paraguay), National University of Mongolia (Mongolia), Amrita Vishwa Vidyapeetham (India), Instituto Potosino de Investigacion Cientifica y Tecnologia (Mexico), Jilin University (China).